It may look like a rather beefy tablet, but the Lynx A is actually a device that could make life easier for graphic artists, animators, architects, 3D printing enthusiasts, and potentially quite a few other people. Putting it simply, it’s a point-and-shoot camera that creates digital 3D models of whatever it’s pointed at. 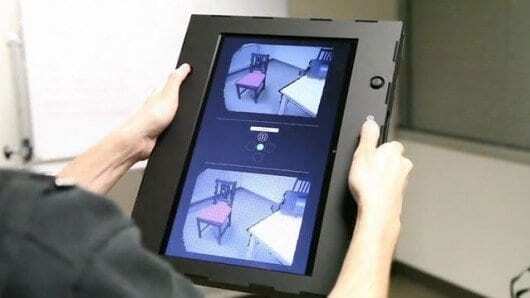 The Linux-based device utilizes a 640 x 480 color camera and a 3D depth sensor to capture images. Users line up, record and review those images on a 14-inch LCD screen, using two joysticks and four button controls. Files are stored on a 500GB hard disk, and output via USB. Included custom software subsequently allows images to be converted to a number of Windows and Mac-friendly formats. There are three ways in which the Lynx A can be used. In Scene Modeling mode, it can capture all of the surfaces within an environment (such as a room) to scale. Users start recording, then just pan the camera around the area. The Lynx A will produce a 3D mesh model of the space, that users can then virtually move through – either on the Lynx’s own screen, or on a computer. Areas of up to 1,000 square feet (93 sq m) can be modeled. In Object Modeling mode, the user walks around an item that they wish to capture in 3D, continuously shooting it from all sides as they do so. Within seconds of finishing recording, the device creates a virtual 3D model of the object. That model can then be exported to any number of programs, including 3D printing software. Finally, people such as animators can select Motion Capture mode. In this case, they just hold the camera still as it records video of a person doing a dance, fighting an imaginary dragon, or doing anything else – the person doesn’t need to wear tracking dots, or any other markers.